A current trend in garden centers is pollinator plants. More and more gardeners are becoming interested in these plants, and local garden centers and nurseries will often have special sections set up to highlight these sorts of plants. Generally, these sections feature plants that are attractive to butterflies, but honeybees and other native bees also would fall into this category. Technically, almost any plant can be considered to be a pollinator if it has pollen and or nectar and is attractive to bees and butterflies. However, there are certain groups of plants that are promoted as pollinators. They seem more able to attract pollinators than other plants. The plant genus Asclepias, commonly known as milkweeds, is quickly becoming more popular at local garden centers. Gardeners have made it a best-selling pollinator plant because they like that it attracts butterflies. As the name suggests, the monarch is considered the king of butterflies. Unfortunately, its population has been in decline. There is more than one cause for this, but certainly a primary reason is the decline of the milkweed plant. The monarch needs it in order to reproduce. Milkweed plants are the sole host plant for monarch butterflies. Many milkweed species can also be a host for the monarch caterpillar, although the crawling larvae prefer some varieties over others. In years past, many farmers would leave a perimeter around their fields for native plants to grow and provide shelter and food for a variety of wildlife. Today, in many cases, this practice has been eliminated and crops are often planted to the edge of the fields. With no food source, wildlife populations diminish. This is where the home gardener can help out — by making pollinator-friendly gardens with a diverse variety of plants. Several species of Asclepias are native to Oregon. These can be incorporated into a native garden very easily. Many garden centers are adding native plant sections. Having some native Asclepias is like a double bonus. It’s a native plant as well as a butterfly attractant. Species of milkweed that are native to Oregon include: Asclepias cordifolia (purple milkweed, heart-leaf milkweed), Asclepias cryptoceras ssp. davisii (Davis’ milkweed), Asclepias fascicularis (narrow-leaved milkweed) and Asclepias speciosa (showy milkweed). It is interesting to note that the monarch butterfly uses these plants as both a nectar source and as a host plant to lay eggs on. Another native Asclepias from Missouri is A. tuberosa (butterfly weed), which has often been used as a bedding plant. 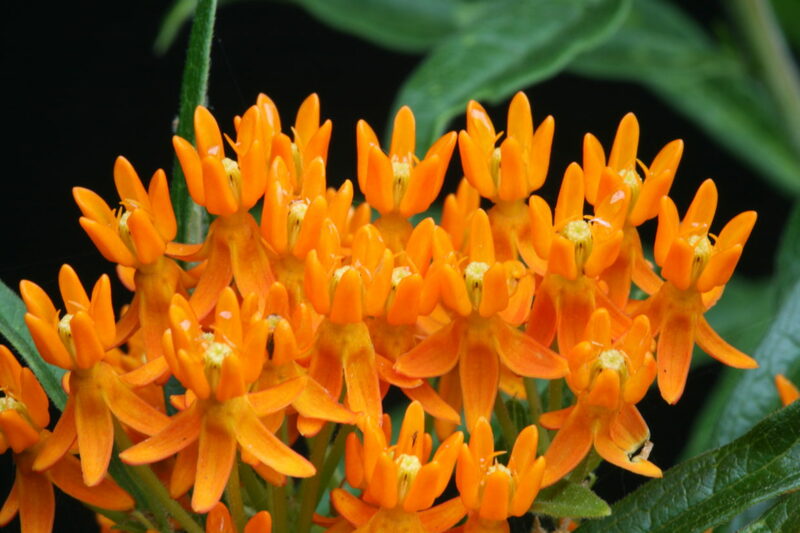 It is noted for the clusters of bright orange flowers and is often referred to as butterfly weed. In 2017, it was named Perennial Plant of the Year by the Perennial Plant Association. 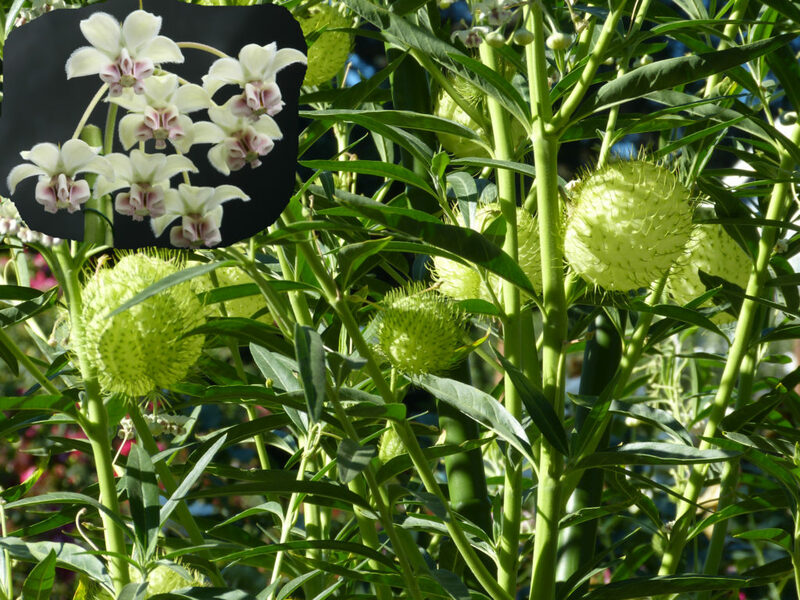 What was once called Asclepias physocarpa has had a name change to Gomphocarpus physocarpus. Whichever name you call it, it is a show stopper in the garden. It goes by the common name of balloon plant, hairy balls, or sometimes family jewels tree. It is the seed pods that draw attention to this plant because they are inflated, lime green pods up to three inches across. 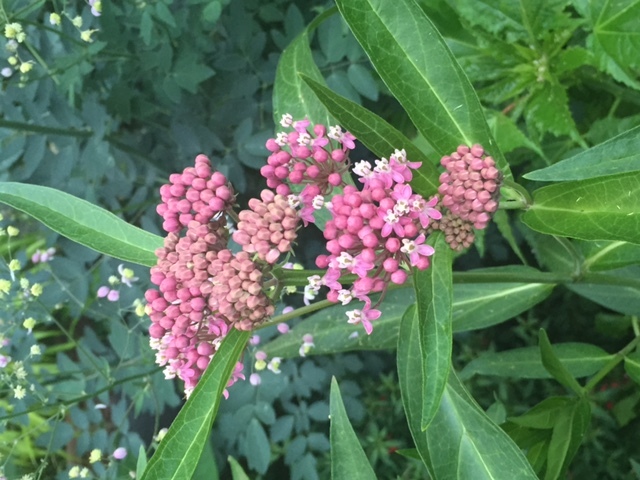 When shopping, you will want to keep a sharp eye out for the name Asclepias, because right now these are hot plants and garden centers can hardly keep them in stock. However, planting pollinator plants in your garden does not have to be just about butterflies. There are other pollinator plants that will attract other pollinators. Our native Ribes sanguineum (flowering currant) is an excellent pollinator plant, as is Solidago (aka goldenrod). Other plants to include would be Ceanothus (California lilac), lavender and annuals such as alyssum, zinnias and asters. There are many others that could also be included.